We had a very quiet Thanksgiving and only one of our kids could come home. I cooked the complete turkey meal and baked a couple of pumpkin pies that morning too. By early evening our son had gone home. All of the dishes were cleaned up and the leftovers put away. I spent a few hours working in my sewing/craft room, then picked up a book that I like to read bits and pieces from often. Thoughtful good deeds, like Maude Fisher’s, used to be very common when most people were reared to put other people before themselves and when quietly doing the right thing was drilled into children and served as the cultural norm. Almost every good deed now is posted on social media, hyped as some fake gimmicky publicity stunt for attention, or used to sell oneself as more caring than someone else. “… died in 1964 and this booklet was unclaimed by her relatives. She was a lovely old lady and it was a rewarding experience caring for her. 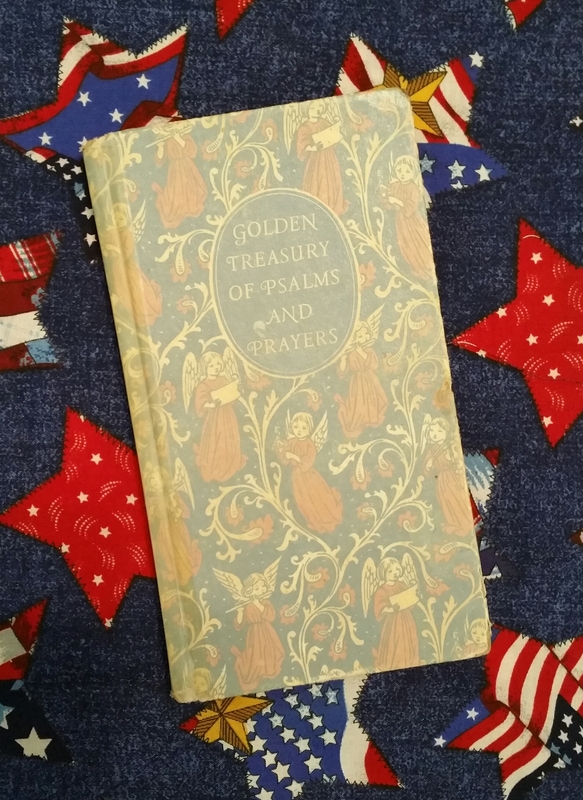 I am giving this to you Susie, as over the years I found pleasure in reading psalms and prayers. In 1980, I was young and considered myself more agnostic than faithful, but my mother was right. Over the years, I have picked up this little book or my Bible and turned to the Psalms when I feel “distressed and unhappy”. In 2001, my mother was hospitalized for several weeks and I began to worry a great deal, even though she and my sisters assured me that she was improving. My mother kept telling me there was no need to come to PA, because she would be out of the hospital soon. Still, I worried and I mailed this booklet to PA and asked my sister to take it to my mother in the hospital. My mother was happy to see it again and to read it. My mother died suddenly and unexpectedly on the day she was supposed to be discharged to a local rehabilitation facility for some follow-on care. My mother quietly helped as many people as she could. She never talked about it, she just did it, because it was the right thing to do. People like Maude Fisher and my mother used to be the rule, not the exception. Watching America’s endless game of partisan one upmanship has caused me to reevaluate my own strident partisan views. Truly, so much of the extreme emotional investment in these “political hills to die on” won’t matter at all if the country is filled with raging partisans, who hate each other. The hate bodes poorly, with many Americans who refuse to even talk to anyone with opposing political views, some want those with opposing views silenced, and there are even some wishing those with opposing partisan views were dead. We could all take a page from Maude Fisher’s and my mother’s book. Caring about other people is about more than clicking “like” on social media feeds or posting about every shallow thought that pops into your head. I wonder how many people attending a funeral today would take the time away from their smartphone to even notice that the sun was setting when a young soldier was buried or the pretty meadow. Assuredly, I doubt hardly anyone would take the time to pick “a few leaves of grass” for remembrance and pen a letter like this to a grieving mother. Your LB, having a good Thanksgiving pleases me, mine today (the celebratory meal) holds a possibility that some unfinished business might progress … “Life-Stuff” you understand so whatever happens isn’t likely to appear in any commentary … I was young once and I’ve been for some time “needful” (as I can) to set things aright. Thanks for the well wishes JK and I wish you the same. It’s funny how sure we are of everything when we are young, then life happens, lol. Thanks also for the links. I’ve been reading some of the letters at that website and enjoying them.